I was born in 1937 and educated at the universities of Cambridge (B.A. Arch. and Anth. 1960) and Harvard (A.M. 1962 and Ph.D. Anthro. 1966). My research interests are in ethnoarchaeology, archaeological theory, African later prehistory and culture history, and in the European Upper Palaeolithic. My first academic position was as Instructor (later Assistant-Professor) at the University of Pennsylvania where, from 1967 to 71 I directed the Upper Benue Basin Archaeological Project, dedicated to finding the Ur-Bantu and ethnoarchaeology. My hunt for Bantu ancestors proved a failure as the they originated not as Guthrie believed in the lands south of Lake Chad but as Greenburg correctly inferred in the Nigeria-West Cameroon region. We did however find some intersting Neolithic and Iron Age archaeology. The ethnoarchaeology was a lot more successful. After teaching material culture in the Anthropology Department of University College London from 1971-74 I moved to the University of Ibadan, Nigeria, serving for four years as head of the Department of Archaeology. From there I was able, with Pierre Vidal, to carry out research on megaliths in the Central African Republic, and in Nigeria. The collapse of the Nigerian university system occasioned by the founding of seven new universities and impoverishment of the old led me to leave the country in 1978 in time to lead a British Institute in East Africa expedition to the Southern Sudan in 1979 and be invited to Calgary as a visiting scholar. Finding no employment as an archaeologist I made a forced foray into business, working for Cambridge Communications as a consultant writing manuals and other reports for businesses and a programmed text on bacteria, viruses and vaccines. The experience was salutary and improved my teaching, In 1980 I returned to Calgary as a visiting professor and was taken onto the permanent staff fhe following year. The university offered me the best working (and playing) conditions of any at which I have served and access to SSHRC funding. I was supported by SSHRC and sometimes other grants almost continuously from 1984, when I initiated the Mandara Archaeological Project in Cameroon, to 2008. From 1980 to 1985 I was founding editor of the African Archaeological Review and head of the Archaeology Department from 1987-92 and in 1997-98. I have been Vice-Président of the Reseau Méga-Tchad and President of the Society of Africanist Archaeologists; like departmental headship, these are positions that one does not necessarily covet but which can be used to good purpose. In 2001 with the late and much regretted Carol Kramer, whom I had known at Penn, I published Ethnoarchaeology in action, the first critical general -- though not encyclopaedic -- synthesis of a subdiscipline that we had both contributed to developing. I retired at the end of that year and began a life of pretty much full time research which is described in the next section. More information is given in other sections and in my Curriculum vitae which contains a full list of publications. During the 1990s we focussed our work on the Nigerian side of the border and especially at Sukur, a mountain chiefdom once characterized as a divine kingdom, an interpretation that our experiences led us to revise. Judy Sterner's 1998 Ph.D. thesis, The Ways of the Mandara Mountains (SOAS, University of London) was published on 2003 by Rüdiger Köppe Verlag, Köln, as a book of the same title in the Westafrikanische Studien series. While this is a regional study it contains a great deal of what we have learned about Sukur. Other publications are listed in my CV. During our stay at Sukur we contributed to, though we did not initiate, the preparation of the citation that led to its being declared a World Heritage site by UNESCO in recognition of its cultural landscape. Additional information and research on Sukur is contained in the Sukur website that we are erratically in the process of developing. Thus is a long term project. A SPOT image of the Sukur region. From late 2001 until 2008 I was heavily involved first with fieldwork in northern Cameroon, once again doing dirt archaeology and investigating what were formerly thought to be stone-built strongholds but now seem more likely to be watch and water towers , and then with the writing up and eventual publication of the sites in 2008 as Performance and agency: the DGB sites of Northern Cameroon. In the meantime I also, with Judy Sterner, carried out fieldwork at Gudur, Cameroon, investigating what was believed to have been a powerful religious center in the 16th-18th centuries and hub of out-migration. Our results (David and Sterner 2009) suggest a different though equally fascinating interpretation, one of a 19th-20th century ritual paramountcy that also comprised a succession of powerful chiefly diviners. During the first decade of the 21st century Judy Sterner and I also put considerable effort into advocating a Mandara Mountains International Peace Park shared between Cameroon and Nigeria, thus far without success. I also edited a volume entitled Metals in Mandara Mountains' society and culture that is to be published by the Red Sea Press, and in 2010 authored a video program entitled The thirteen months of Sukur, Africa's first World Heritage Cultural Landscape. This attempts show how technology, society and ideology working together over time generate a cultural landscape. It is old-fashioned in concept, but the first ethnographic film to show a complete seasonal round. The Mandara Mountains Home Page prepared by our colleague Gerhard Müller-Kosack contains much valuable material in several media on the ethnology and other aspects of the Mandara moutains region. For several years, ceasing ca 2004, I accumulated a bibliography of ethnoarchaeology and related studies, partly for purposes of teaching, partly because I was engaged with Carol Kramer in writing Ethnoarchaeology in Action, and needed a bibliographic data base to work from. and by The Social Science Information Gateway "Making sense of the Internet for social scientists"
You are free to make use of these files for non-commercial purposes. Nicholas David and Carol Kramer. 2001. Cambridge University Press. This is a first and comprehensive study of what remains, despite its centrality and multiple linkages, one of anthropology�s lesser known subdisciplines. First developed as the study of ethnographic material culture from archaeological perspectives, it has expanded its scope and relevance over the past half century especially to cultural and social anthropology. The authors are leading practitioners, and their theoretical approaches embrace both the processualism of the New Archeology and the post-processualism of the 1980s and 90s. The book takes a case-study approach and is balanced in its geographic and topical coverage, including consideration of materials in French and German. Three introductory chapters introduce the subject and its history, survey the broad range of theory required, and discuss field methods and ethics. Ten topical chapters treat formation processes, subsistence, the study of artifacts and style, settlement systems, site structure and architecture, specialist craft production, trade and exchange, and mortuary practices and ideology. The book concludes with an appreciation of ethnoarchaeology�s contributions, actual and potential, and of its place within anthropology. Generously illustrated, it includes photographs of many leading ethnoarchaeologists in action. Simplified map of east-central Irian Jaya (Indonesian New Guinea) showing the Highlands (shaded) and Van Rees mountains, main peaks, major rivers, and some government centers. 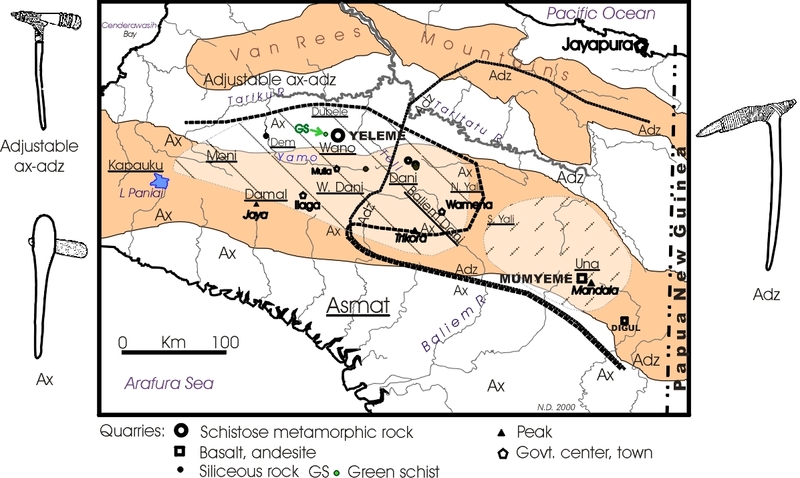 Selected quarries are indicated, together with the main areas of distribution (hatched) of rock from the Yeleme and Mumyeme quarries, and the areas of distribution of axes, adzes, and, to the north, adjustable ax-adzes (haches à pince et tête pivotante). Names of ethnic groups are underlined. Data from Pétrequin and Pétrequin (1990) and other sources. The links take you to the bibliography (in .pdf format) and, if you have ProCite 4.03 or later, the corresponding *.pdt and *pdx files. Hold down the SHIFT key and click on the .pdt file and a Save dialogue box will appear. Repeat to download the .pdx file. By a combination of preparation and luck I began making ethnographic videos, primarily with ethnoarchaeological purposes in mind, in 1984. Videography has since become an integral part of fieldwork although a prime aim -- to discuss the work of artisans and others while sitting and watching video footage with them -- has been frustrated by my inability to bring informants, videotape and a functioning television set together while in the field. On the two occasions before my small NTSC set blew up, with the Mafa ironmaster Dokwaza and the Sirak potter Gobway, it was highly productive. All four programmes listed below are designed for a variety of audiences including senior high school and university students of anthropology, archaeology, materials science and African studies, the �intelligent viewer� of North American PBS stations, and of course Africans in all walks of life. 2010 The 13 months of Sukur: Africa's first World Heritage cultural landscape. Watch the YouTube trailer. All these videos are available for sale from myself at very reasonable prices. Email me at sukurfilm (at) gmail (dot) com. I finished regular teaching in Fall 2001. Over two decades ago I was asked to talk to graduate students about writing an article. The talk was a success and a revised version was later adapted by M. Bisby for biologists and published in the Canadian Federation of Biological Sciences Bulletin (1989) 7 (1):26-29 (with a less than perfect translation into French). I was asked to give it again in 1999 and decided to put it on the WWW. Here is the link. Metals in Mandara Mountains' society and culture is the title of a volume edited by myself and published in 2012 by the Africa World Press (Trenton NJ). Metals, and especially iron, are indispensable factors of production and destruction, deeply embedded in social relations and cultural life. In the Mandara Mountains of Cameroon and Nigeria anthropological research over a period of six decades has generated a rich, indeed critical, mass of data that stimulates exploration of a multi-facetted and complex relationship. Metals in Mandara Mountains' society and culture is the collaborative product of researchers from six nations, all with long and ongoing experience of the mountains and their multi-ethnic montagnard inhabitants. Part I sets the stage, introducing the regional geography, physical and human, smelting and forging as practiced in the 20th century together with their expression and significance in the archaeological record, and early studies of metallurgy. Part II analyzes the integration of iron workers into their societies, the economics of iron production, recent competition between montagnard and lowland smiths, and the factors that generate disparate patterns of typlogical variation in agricultural hoes and men's knives. Part III examines the separation of iron workers into a caste from cultural historical, archaeological and social anthropological perspectives, besides presenting case studies on the differential roles and associations of iron and brass artifacts. Part IV, an afterword by Jean-Pierre Warnier, reflects upon the tensions between authors' conclusions while emphasizing that technologies are embedded in systems of agency that transform the persons involved. In summary, Metals in Mandara Mountains' society and culture is unique in exploring the implications of metallurgy for society and culture from points of view that together add up to a regional and multidisciplinary mosaic in which the results of different approaches - ethnographic, archaeological, ethnoarchaeological and social anthropological - throw light upon each other. A number of the book's original illustrations were in color, including maps. For reasons of cost the publisher had to reproduce them in grayscale.Therefore I am making available the color figures in appropriate sizes and resolutions via this site. Here is the link. and only by the best kind of people.